Sosi Black-on-white pitcher. Click the image to open the Sosi Black-on-white gallery. 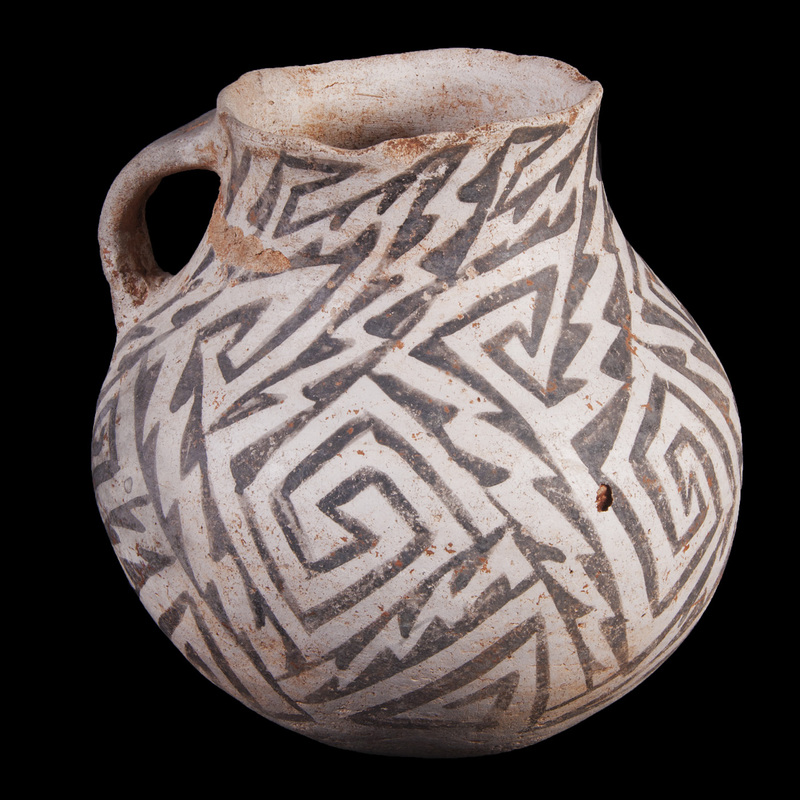 Sosi Black-on-white is a Tusayan White Ware type characterized by bold designs and found across northeastern Arizona. Firing: In a reducing atmosphere. Core Color: Dark gray to light gray. Temper: Abundant fine quartz sand. Surface Finish: Both surfaces of bowls and exterior surface jars are compacted or coated with thin white slip; bowl interiors and jar exteriors moderately polished; scraping marks visible on unpolished surfaces, sometimes on polished surfaces. Surface Color: Bluish white or pearl gray. Forms: Bowls, dippers (rare), and jars. Vessel Thickness: 3.2 to 6.7 mm (bowls). Design: Bold and free, suggestive of Black Mesa Style; horizontal stripes make up major part of design, with large solid areas, triangles frequent, stepped elements, interlocking scrolls rare; striped or wide line width with large solid triangles, simply or in series, strongly suggestive of the barbed lines on Flagstaff Black-on-white, but heavier and bolder; the decoration of both styles covers most of the bowl interior; bowl exteriors are undecorated; rims are undecorated; jar decoration is confined to the neck and upper body. Comparisons: Flagstaff Black-on-white, somewhat less bold in treatment; pinnate lines and coarse cross-hatching frequent; often rather less well-polished. Width of lines average 3.5 mm while Sosi Black-on-white has wider lines averaging 6.7 mm. Holbrook Black-on-white has dark gray paste, temper of white angular fragments, and a surface with a heavy white slip. Escavada and Puerco Black-on-white have mineral paint. Black Mesa Black-on-white treatment is somewhat less bold and execution less precise, elements are more closely massed, pendent dots and continuous rows of solid triangles are frequent. Other Names: Black-on-white Ware; Proto-Kayenta Black-on-white; 3rd Tusayan; Tusayan Black-on-white; Black Mesa Pueblo II Black-on-white. Colton, Harold S., and Lyndon L. Hargrave. (1937) Handbook of Northern Arizona Pottery Wares. Museum of Northern Arizona Bulletin 11, Flagstaff, Arizona.